Commercial bin cleaning covering the Wirral area. Over time Commercial Bins can start to smell and attract all kinds of unpleastant creatures. We provide an efficient on-site commercial bin cleaning service to a wide range of businesses and institutions throughout Wirral & The Merseyside area. We also offer bin storage cleaning. 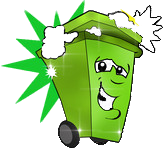 From one off cleaning to regular cleaning, we understand the importance of having a friendly, professional service, and at D & D WHEELIE BIN CLEANING SERVICES customer satisfaction is always our goal.